Title is the full error message I get after pressing Install on the Update pop-up window after opening Sublime Text3 3.2, Build 3200. I’ve updated my client several times over the years simply using the ‘notification window’ that pops up when there’s a new version/build. It has always worked until this time (2019-04-06). Tried restarting computer, shutting down all other applications but still I get the error “Unable to launch update installer” after pressing Install. Same behavior trying to update Version 3.2, Build 3200. 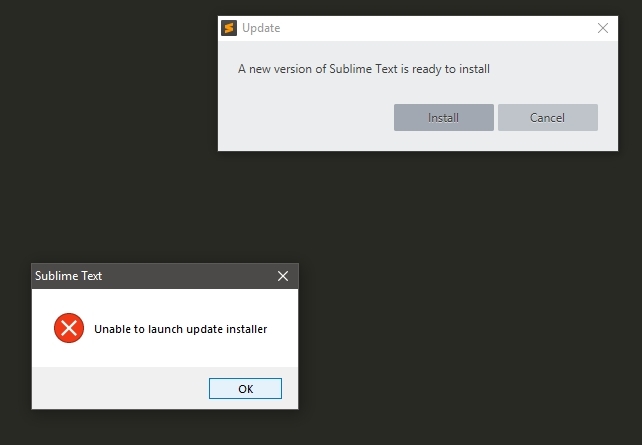 I was able to update sublime text 3200 to 3207 after i copied an update_installer.exe from my colleague. But i lost license after update, and this is a company related license. So no clue why it worked this time but I tried going straight to executable and running as Admin and that did not work. Until just now (5th try over the last couple days). So try running the program as Admin and Check For Updates. It should eventually work. Sorry, that’s all I got but it updated. I think the general workaround is to download the appropriate full installer from the sublime main site and run that to upgrade. It works for me. On this old version of Debian the 3200 do not work after installing. Last compatible version is before 3200. On Windows 7, running Build 3200 as administrator resulted in the update to build 3207 completing successfully.